Three most common methods to control flow of fans are discharge air dampers, bypass dampers and inlet guide vanes. The Figure compares the power needs of these methods to direct control using frequency converters. Outlet dampers increase the resistance of the air flow much the same way a valve modulates the pump output. The fan remains at constant speed. These dampers are metal plates positioned in the air stream on the outlet of the fan. Volume is reduced by closing the damper. Closing the damper increases the system pressure which results in very little energy savings. Bypass dampers are least effective method of air flow modulation. The fan remains at constant speed. The air flow in these systems is controlled by bypassing the flow from the fan discharge to the fan intake. This type of control is simple and low in first cost, but does not conserve energy. Variable inlet guide vanes directs air as air enters the fan. 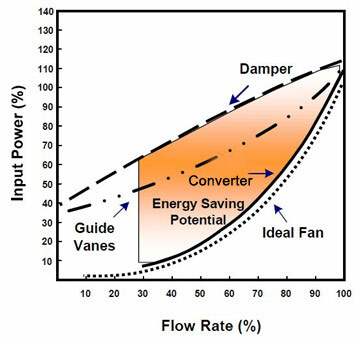 With these vanes, power requirements drop significantly as flow is decreased. The fan remains at constant speed. Volume is reduced by changing the vane position. Maintenance of these systems can be expensive as the operators an linkages are mechanical and need to be maintained. Frequency converters offer the greatest savings for fans. Power is greatly reduced (more than inlet vanes) as flow and speed decreases.